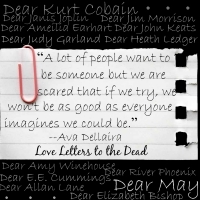 Reading Love Letters to the Dead by Ava Dellaira was a somewhat strange experience. I knew from the start that this book would probably make me cry. And I was right. But not for the reasons I thought. To start back at the beginning, let me just say that I really loved this book. It reminded me so much of The Perks of Being a Wallflower. But it wasn't the letters or even certain events that made me think about Perks, but rather, it was the way this book seemed to break me in half, shattering me, and then putting me back together again. I suppose the thing about being put back together, as I'm sure Laurel could explain too, is that when the glue dries, you realize you've become slightly different from the previous version of you. That's how I felt waking up the day after finishing this; eyes still tired, heart still broken over the book I'd finished the night before. I felt like I was different for having read those words, which is truly special. I've never lost anyone in the way that Laurel loses her sister, May. But I think we all can agree that losing people, whether to death or life is just as painful. And this book is really about the living. It is through a bunch of letters written to people who are dead that Laurel is brought back to life. This epistolary novel reveals the heart and soul of human nature in a way that feels authentic. The prose is permeated with beautiful, lyrical lines that whisper about the amazing power of one word after another after another; creating magic. Laurel talks about this kind of magic. Sometimes it makes her sad. And sometimes it makes me sad to think that we all have the power to create magic, but not the ability to see it when we should. Reading about those who have passed on recreates them and Dellaira gives us a way to see Kurt Cobain and Amy Winehouse and even Heath Ledger again. She helps us remember that people are memories and that if we hold on to them they will never really be gone. And that's magic too. Remembering is a gift. Whether or not you've experienced a loss like Laurel's, this book is just as wonderful! Sometimes we need stories to help us understand life and this is one of those stories. So pick up a copy of Love Letters to the Dead today!